Squamous cell carcinoma of the gallbladder is rare and accounts for about 12.7% of all cases of gallbladder cancer. Pure squamous cell carcinoma is even less common with a reported incidence of 3.3%. We present a case of 72-year-old African-American woman with decreased appetite, fatigue, and weight loss associated with intermittent right upper quadrant pain for two months. Computed tomography of the abdomen revealed a mass in the gallbladder and the hepatic flexure of the colon with involvement of adjacent small bowel. On exploratory laparotomy, a mass at the dome of the gallbladder was found with local invasion of the hepatic flexure, and the proximal transverse colon. There was no obvious involvement of the duodenum, common bile duct, or the extra-hepatic biliary tree. An extended right hemicolectomy, distal small bowel resection, cholecystectomy, a wedge resection of the liver and a feeding jejunostomy, were performed. Pathologic evaluation demonstrated well to moderately differentiated squamous cell carcinoma of gallbladder without evidence of distant metastasis. The patient improved clinically and was discharged home in good condition. Squamous cell carcinoma of the gallbladder is rare and accounts for about 12.7% of all cases of gallbladder cancer [1-4]. Pure squamous cell carcinoma is even less common with a reported incidence of 3.3% [1-4]. Squamous cell carcinoma (SCC) of the gallbladder usually presents with an ill-defined clinical course and is frequently detected at an advanced stage because of its tendency to infiltrate adjacent organs and silent rapidly growths pattern [1,2]. It was reported that the survival of patients with squamous cell carcinomas/adenosquamous carcinomas was significantly worse than that of gallbladder adenocarcinomas, and this adverse prognosis persisted when compared with stage-matched advanced gallbladder adenocarcinoma cases . The overall prognosis of squamous cell carcinoma/adenosquamous carcinoma appears to be even worse than that of ordinary adenocarcinomas . We present a case report of an African American female with pure squamous cell carcinoma of the gallbladder. Post operatively our patient improved clinically and was discharged home in good condition. A 72-year-old African-American woman presented with decreased appetite, fatigue, and weight loss which was associated with intermittent right upper quadrant pain for two months. Abdominal ultrasound showed cholelithiasis, and a 7.6 cm soft tissue mass adjacent to gall bladder. Computed tomography of the abdomen revealed a mass in the gallbladder which also involved the hepatic flexure of the colon. On exploratory laparotomy, a mass at the dome of the gallbladder was also found with local invasion of the hepatic flexure and the proximal transverse colon. There was no obvious involvement of the duodenum, common bile duct, or the extra-hepatic biliary tree. An extended right hemicolectomy, distal small bowel resection, cholecystectomy, a wedge resection of the liver, and a feeding jejunostomy were performed. Pathologic evaluation demonstrated a well to moderately differentiated squamous cell carcinoma of gallbladder invading into wall of colon. Post operatively patient improved clinically and was discharged home in good condition. Grossly, the gallbladder was filled with gallstones and an ulcerated round mass measuring 7 × 6 × 5 cm, was protruding from the gallbladder wall into the gallbladder lumen (Figure 1). Cut section revealed an irregular ill defined firm tan mass with fresh necrotic surface. Microscopic examination demonstrated well to moderately differentiated large flat squamous cells with keratinized foci and tumor cells exhibiting intercellular bridges (Figure 2). Few mitoses were observed. Angiolymphatic invasion was present. 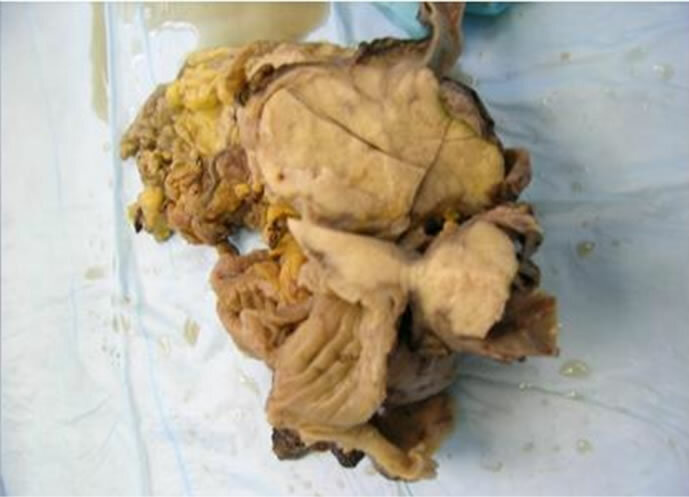 The carcinoma perforated the gallbladder wall and directly invaded into muscularis propria of the colon (Figure 3). Squamous cell carcinoma was present in local lymph nodes. No evidence of distant metastasis was identified. Figure 1. Gross examination reveals a tumor mass within the gallbladder lumen and invades adjacent structure (2×). Figure 2. 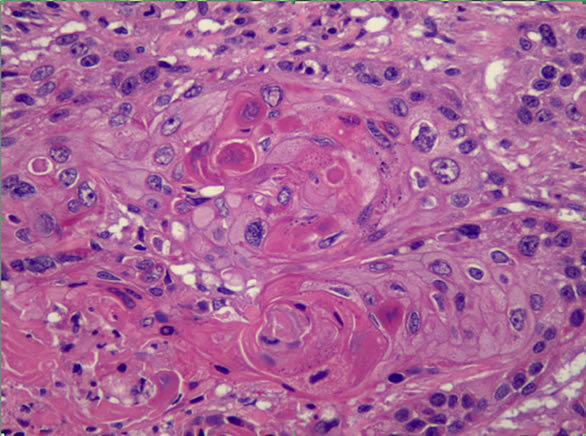 Microscopic examination reveals tumor composed of well differentiated squamous cells characterized by keratin pearls and intercellular bridges (20×). Figure 3. Microscopic examination reveals tumor invades into adjacent colonic wall (10×). aggressive form of gallbladder cancer. It usually presents as an invasive growth and spreads by local invasion. Patients who develop squamous cell carcinoma of the gallbladder have a poorer long-term prognosis than patients presenting with adenocarcinoma of the gallbladder [1-4]. Adenocarcinoma of the gallbladder is the most common type of gallbladder cancer with a 3:1 female to male predominance. Gallbladder cancer commonly presents between the 4th and 6th decades of life . Gallbladder cancers are asymptomatic at early stages. When symptomatic, the presentation is similar to biliary colic or chronic cholecystitis. If signs of biliary colic or chronic cholecystitis are present in an elderly patient in combination with weight loss and anorexia, gall bladder cancer should be considered as a differential . Biological behavior of squamous cell cancer is characterized by rapid growth, early metastatic dissemination and diffusely local and regional infiltration. The tumor grows laterally along the fossa of the gallbladder forming large infiltrative masses that typically invade the liver and adjacent organs by direct expansion as demonstrated in our case . Despite local and regional infiltration, peritoneal seeding is rare. Hepatic metastases are more frequent in squamous cell carcinoma than adenocarcinoma of the gallbladder . The duplication time for squamous cell carcinoma (SCC) is half that of adenocarcinoma. SCC growth is faster than that of adenocarcinoma and is therefore more aggressive. SCC is usually diagnosed when the tumor is large in size and locally advanced. The prognosis is therefore worse than adenocarcinoma [1-4]. Up to 12.7% of gallbladder cancers are squamous cell carcinomas but these estimates include heterogenous neoplasms such as adenosquamous carcinomas and some misdiagnoses as mentioned by Roppongi et al. . According to Surveillance, Epidemiology, and End Results (SEER) Program of the National Cancer Institute, out of 3038 patients with gallbladder cancer only 45 (1.7%) were squamous cell carcinomas [4,7]. It is unclear as to how many of these tumors were pure squamous cell carcinomas. Embryologically the gallbladder originates from the foregut . Therefore, most gallbladder carcinomas are heterogeneous during neoplastic transformation. As a result, pure squamous cell carcinomas of the gall bladder are a rare entity. SCC of the gallbladder is thought to arise from the basal cell layer of the epithelium. 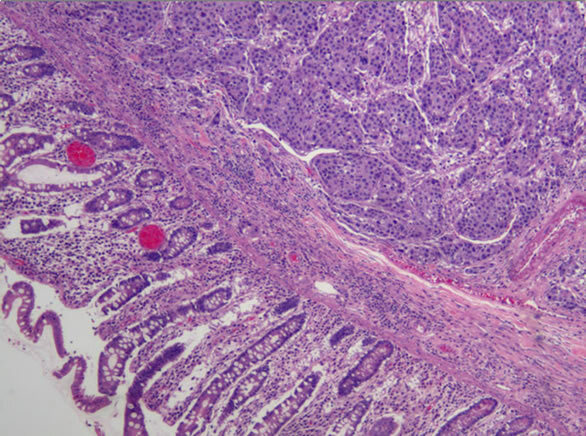 It is also hypothesized that it can arise from the squamous metaplasia or squamous differentiation of a pre-existing adenocarcinoma. Others believe squamous cell carcinoma originates from squamous differentiation of the adenocarcinoma via expression of mixed phenotypes within a single tumor . Radical resection is the mainstay of treatment for patients with locally invasive squamous cell carcinoma and offers the only chance for cure. The extent of tumor invasion at the time of diagnosis is the most important parameter in determining survival. Death occurs within 6 months of diagnosis without radical surgery [1-4]. Complete removal of the gall bladder cancer should be the goal of any surgical intervention. For T1 tumors discovered on pathology evaluation after cholecystectomy, no further surgical treatment is needed. T2 or higher tumors must be treated with radical resection. Surgery in such cases should include cholecystectomy, limited segmental resection (segment IVb/V to which the gallbladder is attached) of the liver, with regional lymphadenectomy and skeletonization of the hepatic hilum. Resection of involved organs is justified in cases of localized lesion without metastases or peritoneal dissemination . Laparoscopy should not be done if gallbladder cancer is suspected. If during initial laparoscopy the diagnosis is suspected, conversion to an open laparotomy should ensue to maximize potential for a curative resection . Postoperative radiotherapy and chemotherapy may be used however results are inconsistent . In a Japanese study of 28 adenosquamous carcinomas and only 1 squamous cell carcinoma of the gallbladder, Oohashi et al. reported that radical resection had a significantly better prognosis than primary resection. A 5-year survival of 49% was reported with radical resection compared to a 3-year survival of 8% with primary tumor resection alone. Significant prognostic factors include residual tumor status, type of resection, patient age, and blood vessel invasion. Residual tumor status was the only significant independent prognostic factor. Patients with no residual tumor had a 5-year survival of 63% compared to patients who with residual tumor whose 5-year survival was nil . Embryologically the gallbladder originates from the foregut. Thus most gallbladder tumors are heterogeneous during neoplastic transformation which makes pure squamous cell carcinoma of the gall bladder a rare entity. Radical resection is the mainstay of treatment for locally invasive squamous cell carcinoma and offers a chance of cure. J. C. Roa, O. Tapia, A. Cakir, O. Basturk, N. Dursun, D. Akdemir, B. Saka, H. Losada, P. Bagci and N. V. Adsay, “Squamous Cell and Adenosquamous Carcinomas of the Gallbladder: Clinicopathological Analysis of 34 Cases Identified in 606 Carcinomas,” Modern Pathology, Vol. 24, No. 8, pp. 1069-1078. M. D’Angelica and W. Jarnagin, “Tumors of the Gallbladder,” In B. L. Saunders, Ed., Surgery of the Liver, Biliary Tract, and Pancreas, 4th Edition, Elsevier, Amsterdam, 2006, pp. 764-781. K. Moore, “The Developing Human,” W.B. Saunders Company, Philadelphia, 1982. *Corresponding author. Present working address: Department of Surgery, Lutheran Medical Center, Brooklyn, NY, USA.